In the beginning the Nevada we know today was a very different place! Oceans covered the globe ... much like it is today but at this point in time the Panthalassa Ocean covered much of what later became the western United States. Sediments of these ancient oceans were later called the Luning Formation and were deposited in what later became the mountain ranges of central Nevada. Ichthyosaur fossils, including Shonisaurus popularis - Nevada's very own state fossil, have been dated to this time. If you ever wanted to envision a "water world," look no further than 230 million years ago, merely a blip in the Earth's lifetime. The first recorded Icthyosaur fossils were found in central Nevada by Professor Seimon W. Muller. These fossils were dated to this point in time (225 mya) just before the Triassic Period. During this epoch, an ancient inland sea linked the Pacific Ocean with the Atlantic Ocean submerging both California and Nevada. Oh where have the oceans gone? Over the course of many thousands of years the seas covering "Nevada" began to recede leaving left behind small plains that covered much of the landscape. These plains as you see them today are called "bajadas" - visible by "layered" rock left behind by the seas receding shores. Ever see a bathtub ring? Additionally, flowing streams on these bajadas also receded forming what are called "alluvial fans." Photo above: A classic alluvial fan, central Nevada. 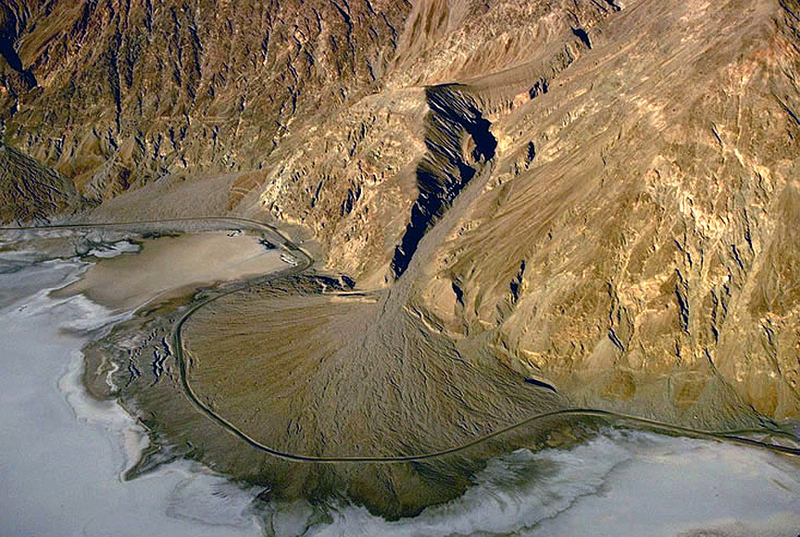 Most alluvial fans form at the mouth of canyons. Over the next few thousand years, the ever-changing landscape consisted of a flood plain that supported dinosaurs! Nevada's dinos included raptors, dromaesaurs, sauropods, tyrannosauroids and iguanodonts. Much of the Nevada you see today was carpeted in marshes and forests. Plant fossils such as conifers, oaks, and ferns are regularly discovered today by geologists - proof that Nevada has been a lush and moist biome much longer than it has been a desert! 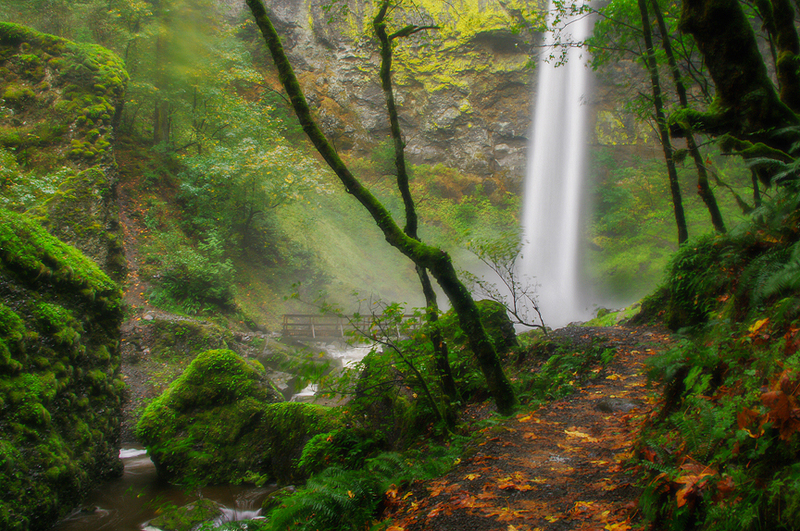 Photo above: The Pacific Northwest is a schoolbook example of what early Nevada looked like! 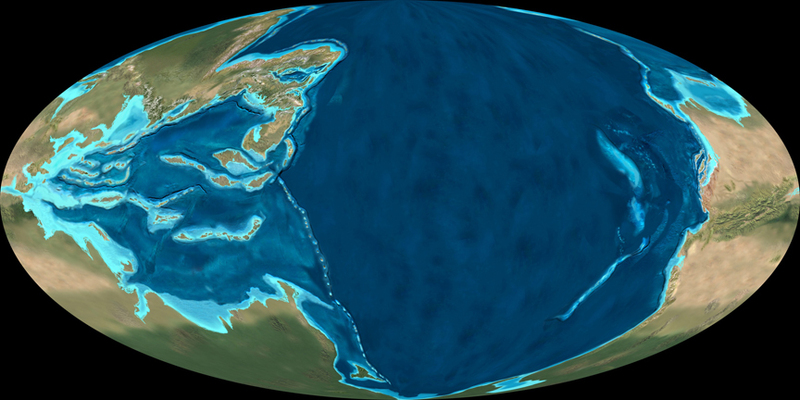 At 50 mya, our rambunctious planet continued to move about furiously. The 50 million-year mark is an important one for the region and begins the very formation of Nevada's extreme rainshadow. The collision of the North American and Pacific Farallon plates began lifting California's Sierra Nevada mountain range so vigorously that the Clear Lake basin of northern California rose above sea level for the first time in a million years! Imagine the earthquakes that would've taken place! The rise of the Sierra Nevada also included the formation of Yosemite Valley, Kings Canyon, and Lake Tahoe each being slowly chiseled away to perfection over the next 20 million years. 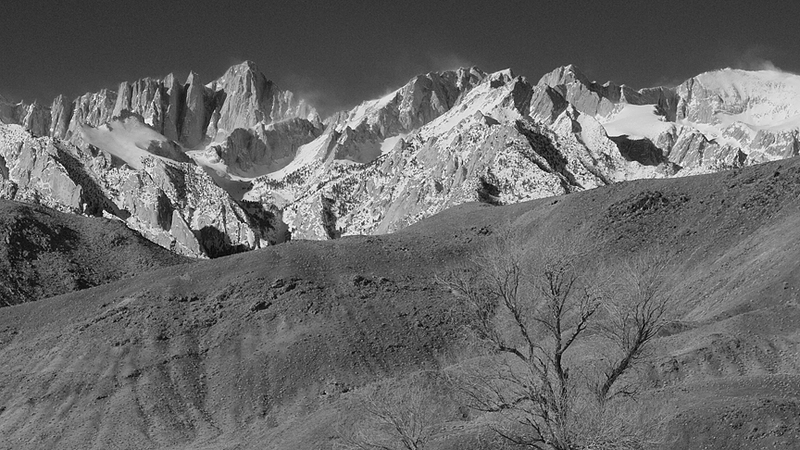 And just when you think Mother Nature was finished, the Sierras continue to rise at an average of 1 inch per year to this day. 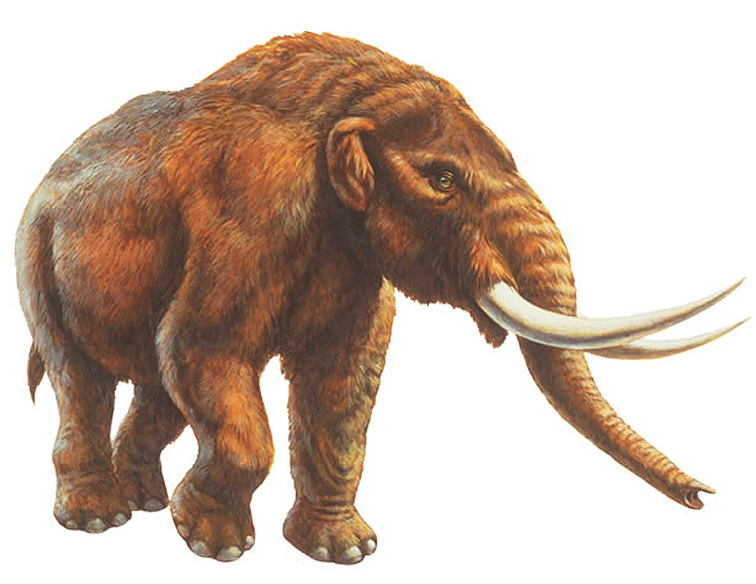 Mastodons, mammoths and prehistoric rhinos roved Nevada at this point in time, known as the Miocene Period. Instead of a lush tropical paradise, the climate began a long and arduous cooling era that quickly turned much of the jungle-like terrain into a frozen tundra. Fossilized teeth from these animals were excavated during the 1970s from numerous mountain ranges in central and southern Nevada. These huge animals were herbivores and really had to struggle to find food in this now-icy climate. Saber Tooth Cats ... Oh My! Our Mastodon friends now encountered predators around this point in time. Saber tooth cats roamed the now-barren hills north of Las Vegas around 15,590 to 12,000 BC. 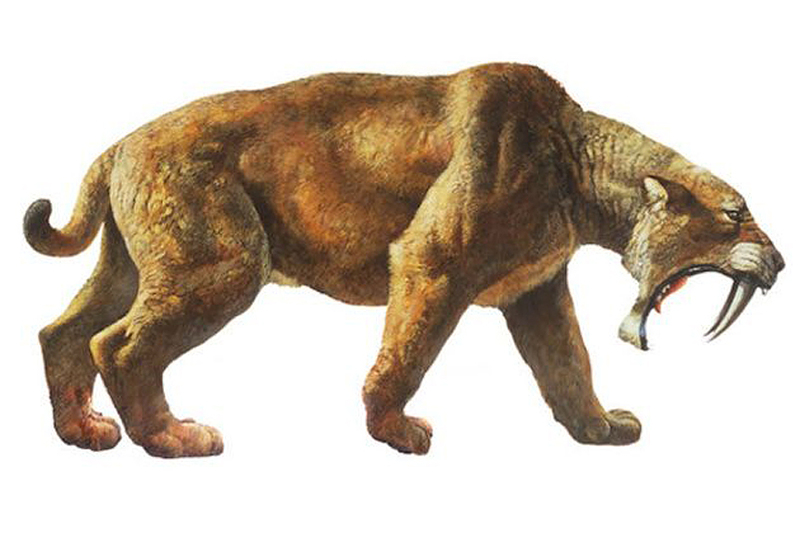 In fact, front-leg fossils of a rather large saber tooth cat were discovered and identified in 2012 by university students in the Sheep Range of today's Tule Springs National Monument. Imagine a 20-foot tall tiger gunning for you. Encountering one of these big cats would've been a frightening ordeal! Petroglyphs dating around 10,000 BC were discovered in the Big Smoky Valley of central Nevada. This spot in particular was home to ancients Lake Toiyabe and Lake Tonopah and provided the perfect environment for the first humans. These were just two of many giant seas that covered the landscape, including Lake Lahontan, an enormous lake that covered much of western Nevada and Lake Bonneville that took up the eastern Great Basin. Today, only a few dozen bodies of water are all that remain of these massive inland seas. The most famous of these belong to us - Pyramid and Walker Lakes here in Nevada! 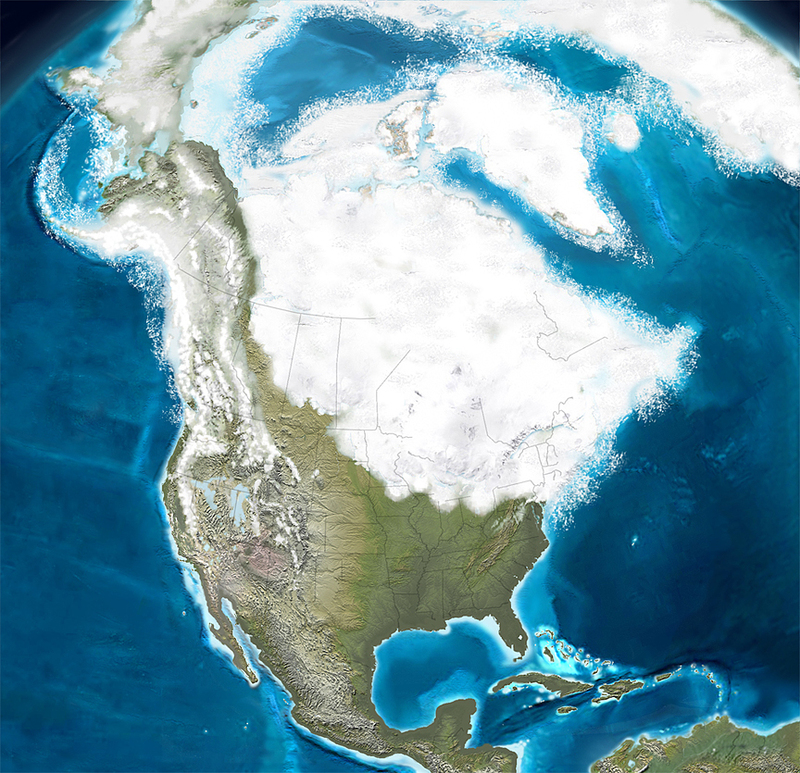 Image above: North America was a much different place 10,000 years ago. Notice Lakes Bonneville and Lahontan not that far away from the southernmost glaciers! 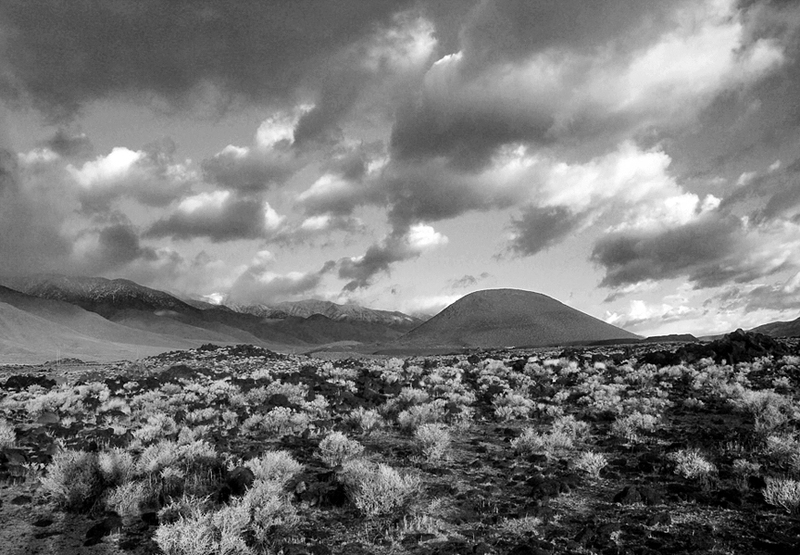 Around 8,000 BC a young volcano called the the Lathrop Wells Cone erupted in "southern Nevada." Ironically, the eruption occurred less than a mile from Yucca Mountain, a site later proposed for the long-term storage of radioactive waste. From this point in time, think for every one thousand years or so the climate in "Nevada" became more and more arid to the climate that we see today. Think about this: the desert we so often take for granted today has come about only in the last ten thousand years, yet its geology and hard exterior was sculpted over millions of years. Click here. We're just getting started!